Positive behavioral support refers to helping people develop and engage in adaptive, socially desirable behaviors and overcome patterns of destructive behaviors. The term typically refers to assistance that is provided for people with developmental, cognitive, or emotional/behavioral disabilities. Positive behavioral support incorporates a comprehensive set of procedures and support strategies that are selectively employed on the basis of an individual’s needs, characteristics, and preferences. The TKJ training will explore research-based methods for supporting people with disabilities with serious behavior problems. Training will be directed to parents, direct care staff, provider agency personnel, early intervention programs, programs providing supports for the deaf and blind, local mental health systems and support coordinators. A portion of the training will be directed at consumers to help them find better ways to self manage and be more involved in the development of their behavior support programs. Positive behavioral support refers to the broad enterprise of helping people develop and engage in adaptive, socially desirable behaviors and overcome patterns of destructive and stigmatizing responding. 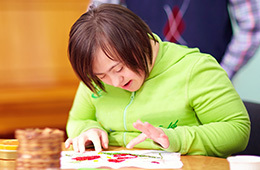 The term typically refers to assistance that is provided for people with developmental, cognitive, or emotional/behavioral disabilities; however, the principles and approaches have much greater generality. Positive behavioral support incorporates a comprehensive set of procedures and support strategies that are selectively employed on the basis of an individual’s needs, characteristics, and preferences. These procedures are drawn from the literatures in operant psychology and applied behavior analysis as well as all other disciplines and orientations that offer demonstrable improvements in a person’s behavior and manner of living. 6. Intervention approaches using systems of least intrusive intervention. One component of the training addresses the mental health/neuropsychiatric issues related to challenging behaviors to help caregivers interface medication therapy and behavior supports by collecting better data for doctor visits, preparing for doctor appointments, and monitoring medication and behavior support plan effectiveness. The following files are from the manual created for the IOTI training. They contain information taught in the training. Also included are forms which we have found helpful in tracking the behavior of the people we support. If you are interested in additional information or to request a training in your local area please fill out this form and we will contact you shortly.